Because your Hawaii vacation time is invaluable, we’ve put together a sample itinerary to help make the most of your stay. Planning with The Chalet Kilauea Collection will ensure that you enjoy the best attractions our island has to offer. Be sure to visit the Volcano Arts Center Gallery, just adjacent to the Visitors Center, to view one of the finest collections of island artists. Then stop by the Volcano Winery and treat yourself to a glass or souvenir bottle. No matter how you choose to spend your time in the National Park, you’re sure to work up an appetite you can satisfy at one of the many Volcano restaurants nearby before returning to your relaxing accommodations at The Chalet Kilauea Collection. Embark on a journey to the Black Sand Beach of Punalu’u Beach Park. The Big Island is the only one where you can find white, green, and black sand beaches. This beach is easily accessible and offers snorkeling, swimming, and seasonal viewings of incredible Hawksbill and Giant Sea Turtles. Consider packing a lunch and enjoying a picnic! After a day relaxing in the sun, you may want to treat yourself to some rainforest rejuvenation at Hale Ho`ola – Hawaiian Healing Arts Center and Spa. Be sure to make a reservation and try their many services! Enjoy dinner at a nearby restaurant in Volcano Village before coming back to relax in the Jacuzzi and enjoy the soothing sounds of the rainforest from your boutique accommodations. Visit The Pana`ewa Rainforest Zoo. This small, 12 acre zoo is the only one in the United States located in a rain forest. With more than 75 species on display, you’ll also find more than 40 species of plants, flowers, and trees for an enchanting experience. While in Hilo, take a hike on Pu’u O’o Trail and enjoy the beauty of the rainforest as you hike over old lava flows. Make sure you’ve brought good hiking shoes and lots of water! The stunning views and lush scenery will make your visit worthwhile. When you’ve worked up an appetite, consider visiting one of the many restaurants in Hilo such as The Seaside Restaurant before making your way back to your Volcano Village accommodations. 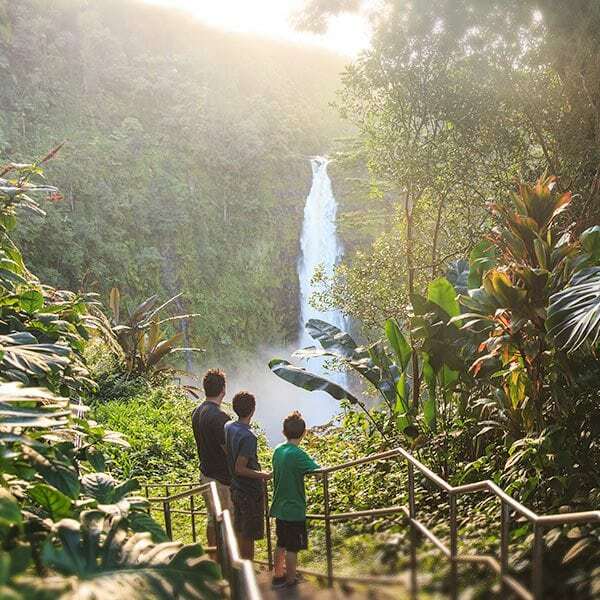 If you are planning on spending additional days, visit our Big Island activities pages for other ideas to make your vacation here especially memorable!